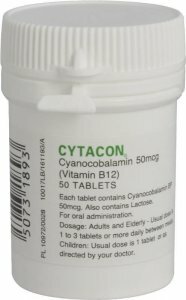 Cytacon Tablets contain cyanocobalamin, which is known as vitamin B12. 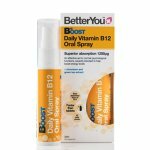 Most people get enough vitamin B12 from their food, but if you have had stomach surgery, or certain diseases of the intestines, or a restricted diet, you may not absorb enough vitamin B12. 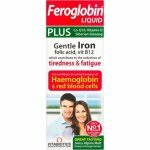 Lack of vitamin B12 in the body causes a disease called pernicious anaemia (reduction in the number of red blood cells) which is often treated with vitamin B12 injections. Cytacon tablets are used to treat vitamin B12 deficiency when injections cannot be used. Always take Cytacon Tablets exactly as your doctor or pharmacist has told you. You should check with your doctor or pharmacist if you are not sure. Please read the label carefully, it will tell you how many Cytacon Tablets to take each day. Adults and Elderly: one to three tablets daily. Cytacon Tablets should be swallowed with water and taken between meals. Do not stop taking this medicine, except on your doctor’s advice. Your doctor may change the dose, depending on how you react to it. DO NOT take Cytacon Tablets if you know that you are allergic to cyanocobalamin or any of the other ingredients of Cytacon Tablets. Those who have an allergic reaction to Cyanocobalamin by injection are often able to take Cytacon Tablets without problems. Take special care with Cytacon Tablets if you have any other medical conditions, speak to your doctor before you take these tablets. Your doctor will want to monitor your response to this medicine carefully, particularly if you are young or elderly. This will probably involve regular examination of your blood every three months for 18 months and then annually. Antibiotics (used to treat infections) and antimetabolites (used to treat some cancers) can affect the blood tests to measure vitamin B12. Cytacon Tablets should be swallowed with water and taken between meals. You should let your doctor know if you are or think you may be pregnant or are planning to become pregnant, or are breast-feeding. As with all drugs Cytacon Tablets should only be given in pregnancy and when breast feeding if absolutely necessary. This medicine also contains lactose (which is a sugar). If you have been told by your doctor that you are intolerant of lactose, contact your doctor before taking this medicine. If you accidentally take too much of this medicine, bring any remaining tablets and this leaflet with you to your doctor or pharmacist so that they know exactly what you have taken. If you miss a dose, take it as soon as you remember, if it is within a few hours of the normal time. Otherwise, leave out that dose completely and take your next dose at the normal time it is due. Do not take double the amount of Cytacon Tablets if you miss a dose. Like all medicines, Cytacon Tablets can sometimes cause side effects, although they are rare and not everyone will get these. Allergic reactions to these tablets are rare but may show as an itchy rash. Very rarely, a severe allergic reaction may occur causing sudden onset of swelling of the face and neck, and shortness of breath. Acne-like and blister rashes have been reported rarely. Do not use Cytacon Tablets after the expiry date which is stated on the box. If your medicine is out of date, take it to your pharmacist who will get rid of it safely. Do not store above 25°C (room temperature). Store in the original container/package. The active substance in Cytacon® Tablets is cyanocobalamin BP. Cytacon Tablets also contains lactose, maize starch, magnesium stearate and purified water. The film coating includes hydroxypropyl methylcellulose, ethylcellulose, acetylated monoglyceride, speed colour white 27120 anstead HSE, isopropyl alcohol and dichloromethane.